Banks are involved in most U.S. dollar creation. Even the dollars created at the direction of the federal government originate with banks. Each time a bank lends, it simply increases the numbers in the borrower’s checking account. That instantly adds dollars to the money supply. When the federal government spends, it sends instructions to a creditor’s bank, instructing the bank to increase the numbers in the creditor’s checking account. When the bank does as instructed, dollars are added to the money supply. This participation in the vast majority of all dollar creation gives banks enormous financial power, and as we all know — and the “Great Recession of 2008” reminds us — power corrupts banks, especially when multiplied by a profit motive and goverment complicity. Although the federal government also is powerful and corrupted, it does not suffer from a profit motive, and that makes all the difference. The government neither needs nor uses profits, and unlike bank employees, federal government employees do not receive remunerations based on federal agency profits. And the answer usually has to do with private industry’s creativity and competitive motivation to improve services and/or prices. Some critics of government hold that private sector employees uniquely are able to develop new and innovative products and services, and federal employees are unimaginative, unmotivated drones. Yet it was federal government people who invented usable atomic energy, landed men on the moon, created thousands of inventions, and run some of the worlds most sophisticated research centers. People are people, whether they are employed by the government or by private industry. Any difference boils down to motivation. Unfortunately, the motivation to improve services and pricing for the benefit of the public sorely is lacking in the banking industry. Attention to service is way down the list of concerns for the biggest banks. The largest banks and their leaders are hypnotized by the billions of dollars to be made by cheating the public, especially when the punishments either are non-existent (no jail time for bosses and the fines are so minimal as to be considered a cheap cost of doing business). Unlike other private industries, the private banking industry, being perverted by the profit motive, is not motivated to improve services, prices, or even honesty. Criminality is rewarded with hundred-million dollar bonuses. The lack of punishment is the fault of a federal government, that itself has been polluted by massive contributions from private banks. The federal government is not impaired by a profit motive. It may seem ironic to suggest that the federal government should own the banks that have, in part, been corrupted by lack of government supervision. But again, the key is motivation. The federal government’s supervision of private banks has been corrupted by the private banks. If there were no private banks, there would be no motive to corrupt government supervision of banks. One can visualize individual instances of a private party bribing a government banking official to grant a questionable loan or to perform some other unethical behavior. But these transgressions would pale in comparison to the widespread cheating of the public the banking industry has made standard operating procedure. Federal ownership of banks may be anathema to those who always believe the federal government is “too big and too powerful” (no matter the current size), and that private control always is better than public control. But, it is the banking industry that is too big and too powerful, and too tainted by personal greed, and too rich, and too ready, willing, and able to corrupt our politicians. Allowing private ownership of banks and expecting honesty is like putting meat on a dog’s tongue, and expecting him not to swallow. Our federal government is supposed to control our sovereign currency, but this control is diluted because the banks, not the federal government, create the majority of dollars. America should not continue to cede such control to a proven-to-be greedy-and-corrupt industry, whose profit motive far exceeds any motive to benefit the public. Private ownership of banks is an invitation to criminality, recessions, depressions and overall actions against the public interest. Finally, privately owned banks can and have become insolvent, costing the innocent public significant dollars. Federal government ownership of banks would eliminate the need for the Federal Deposit Insurance Corporation as well as the dangers to the public of insolvency and under-insurance. In Summary: No public purpose is served when the banking industry is in private hands. For many of the same reasons the U.S. Treasury is owned by the federal government, the federal government also should nationalize and run all banks. you would have seen Ellen Brown’s posts on this topic? She praises some bank in North Dakota that acts differently from normal commercial banks. 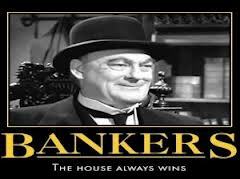 Here in Oz our Commonwealth Bank was a wholly owned government bank until the neo-liberals privatized it. Now it’s Australia’s biggest company. I have seen that happen across the world. Time I assume to reverse the trend? The Bank of North Dakota is a state-owned, rather than a federally-owned bank. It is much less subject to the profit-hungry greed of privately-owned banks and their bankster CEOs, and seemingly has been a good neighbor for the citizens of ND. However, because ND is monetarily non-sovereign, the bank must at least break even. So, for instance, it must charge interest on student loans, which is a negative. A federally-owned bank would have no need to charge interest, and even have no need to make loans. It simply could give money to people, according to whatever rules the government established. State and local governments do this all the time for favored businesses, for instance, baseball teams that want a new stadium (but in that case, the taxpayers pay). By the way, how the extreme right-wing crazies known as “neo-liberals” got their name is beyond me. Saying they are “liberal” is like saying a piano “key” opens a lock.